With the big-screen release of “Beauty and the Beast 3D,” Belle and the Beast want you to be their guest yet again, this time with a new dose of dimensionality. And PopcornBiz is taking you deeper too, as Paige O’Hara – the voice of Belle herself – escorts us 20 years back to the early days of the film that become the first animated feature to be nominated for Best Picture and was destined to become one of Disney’s most beloved creations. Like any Disney classic, new audiences will be introduced to this movie for years to come, but right now there’s an extra bit of excitement with the film being seen in 3D for the first time. I know – Isn't it amazing? It's 20 years now, and it's like, 'Okay, here we go!' I've been working for Disney this whole time, and now I'm working with them as an artist as well because they signed me on for Disney Fine Art two years ago, so I'm painting for them. So I think it's fantastic, absolutely. I'm really excited about this and I think that being able to be inside of the film, which is pretty much what you are with the 3-D, is a whole other experience than just viewing it as a film on a regular screen. I think they're both fantastic in their own way, but look: I'm really excited not only as the actress but as an artist to see these paintings up close and personal! From what I understand it's like looking at a Da Vinci, so I can't wait to see it from that aspect as well. And you got to actually be inside this movie when it was made. How did this film first enter your life? Well, 'The Little Mermaid' had its great success and I was working in New York as a Broadway actress, and I read about the part in The New York Times and my agent got me an audition. I auditioned five times and it was one of those roles – and there have only been a couple – where I actually felt that I had the job before I was offered it. This was one of those experiences. I just felt that it was my turn and it was my part, and luckily I was right, my instincts were right. What was it about the character of Belle that made you feel like you would dovetail with her like you did? Well, from the very beginning at the audition they wanted an old fashioned style of film, but they wanted a woman that was ahead of her time, a woman for this character that sounded more like a woman than a girl. Consequently my voice – I was 30 years old, but they said, 'We want your voice. We want her to have a womanly quality to her, even though she's only 18 years old. We want her to be mature beyond her years.' Because of that maturity she's very, very intelligent, very knowledgeable of books. Her goal in life was not to get a man. Her goal was to learn about life and its center, and she was so far ahead of her time. She's a little odd in that terms of that, in terms of the people around her and her peers. I was odd growing up myself. I mean, I was into musical theater and Gershwin and Rodgers and Hammerstein while people were going to Led Zeppelin concerts. So I understood that, that she was not the norm. I wasn't the norm either. I was very focused on my career, on my performing all through my childhood and my teens. My friends were getting involved in drugs or whatever and I was just not interested. I had a one-track mind, and I think that Belle was like that a lot. Vocally it was kind of nice. At my first audition I thought that they might want to raise my voice and make me sound more like Snow White, and they said, 'We love your voice. We want you to do it just like you.' So that was kind of wonderful. Obviously you worked in the recording booth for a while before you ever got to see a second of film. When you finally saw the finished movie, was it more than you envisioned it would be? It was far more beautiful, and I have to let you know that unlike most other films, Robby [Benson, the voice of the Beast] and I actually recorded together. We didn't have to be alone, and I think that was very important. 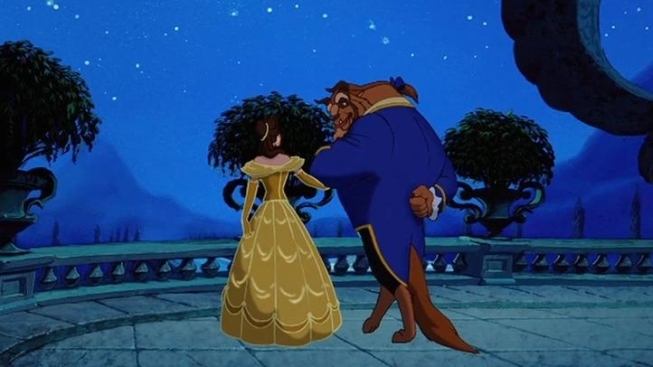 Disney had to spend a lot more money and time to do that, but it consequently developed the film and the relationship with Belle and Beast, so I think that was a very smart thing on their part. But certainly when I saw it I was absolutely blown away. I was mesmerized. The animators are actors with their pens and pencils, the way that that they incorporated my gestures and expressions. So, they're actors that could paint, and now me, I'm painting for Disney and I'm learning so much from them. I can't wait to see up close and personal what these paintings look like. Being a part of all these amazing voice actors and singers, the Disney family, have you made some interesting and meaningful friendships in that group over the years? Definitely with Robby Benson and his wife Carla. That's been a relationship that's ongoing. And with Jerry [Orbach], God bless him, before he passed away; [Producer] Don Hahn and [director] Kirk Wise. It's like a family, and that the thing with Disney that's so mind boggling to me, that after these 20 years where I've been through a lot with losing family and they've always just been so supportive of me in every aspect. That has single-handedly been mind-boggling and very important and special to me. Do you remember the moment in the recording booth where you and Robby realized that you had something special going on, that it was clicking? Absolutely. We knew that it was special pretty much the whole time and then in terms of it going to the next level it was a film festival in New York that made us realize that with all the tough critics. It was presented 70% completed and the rest were sketches and the tough New York audience gave it a 10-minute standing ovation. We kind of went, 'Okay, okay. This is a really good movie!' It was amazing. "Beauty and the Beast 3D" opens in theaters everywhere Friday, January 13th.